Course 5: The Creeds: What is the core of Christian belief in greater depth, as shown through the Nicene and Apostles' Creeds? These six sessions aim to equip the reader with an understanding of the creeds as priceless resources for living the Christian life and for knowing God better. In Session 1, we look at what it means to say: "I believe" and "We believe" and at the role the creeds play in strengthening our relationship with God. Session 2 explores what it means to understand God as Trinity: one God in three persons. Sessions 3 and 4 take us deeper in our understanding of Jesus and look at the way Christ is fully God and fully human and at the great work of redemption on the cross. Session 5 explores the person and work of the Holy Spirit, and Session 6 at what we believe about the Church. 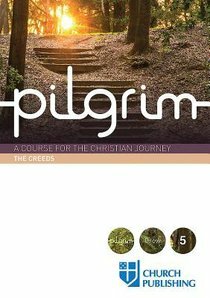 About "A Course For the Christian Journey (The Creeds) (Pilgrimage Series)"
Stephen Cottrell is Bishop of Reading and, within that role is Chair of the Diocesan Board of Education. He enjoys telling stories about Naughty Nora in many schools across the Diocese. Stephen has a wealth of experience in building up the faith of the worshipping community and helping to develop mission and ministry. He is author of many books and has written widely on evangelism. He is also one of the contributors to the Emmaus course. Paula Gooder (D.Phil., University of Oxford) is a part-time tutor at the Queens Foundation for Ecumenical Theological Education in Birmingham and a freelance writer and lecturer on the Bible. She also is Canon Theologian of Birmingham Cathedral, Visiting lecturer at King's College, London, Associate lecturer at St Mellitus College, London, an Honorary Lecturer at the University of Birmingham and Senior Research Scholar at the Queen's Foundation, Birmingham. She is a Reader in the Church of England and a member of General Synod. Steven Croft is a former Archbishop's Missioner and the first Team Leader of Fresh Expressions. He became the Bishop of Sheffield in 2009. He is the author of many acclaimed books including Jesus' People: What the Church should do next and editor of Mission-shaped Questions. Steven is the co-creator of the Emmaus: The Way of Faith course. ROBERT ATWELL is the Bishop of Stockport. A former Benedictine monk, he is the compiler of two of Canterbury Press' all-time bestselling titles, Celebrating the Saints and Celebrating the Seasons.